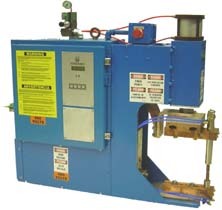 The Jenzano Heavy Duty Bench Welder is a multi-purpose spot OR projection welder that offers a heavy duty, reconfigurable design. The bench design and the ability to use multiple units in unison allow for maximum flexibility while minimizing floor space requirements. Boasting T-slotted upper and lower plates and a precision roller bearing slide, Model H3BW affords optimal efficiency. Max weld force: 4000 lbs. Dimensions (HWD): 35" x 9" x 40"